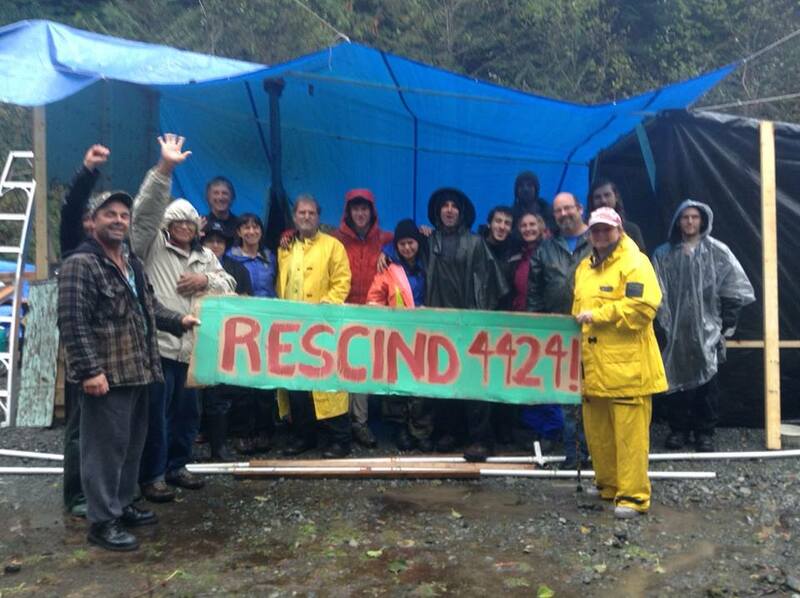 In direct response to government approval for Teal-Jones’ logging of cutblock 4424 in the intact old-growth rainforests of the unprotected Central Walbran Valley, Friends of Carmanah/Walbran established a witness camp on September 24th, 2015, located at the bridge over Walbran River. The purpose of the camp is to maintain a continuous wilderness presence, enable the public to see the natural beauty of forests slated for logging and to serve as a gathering place to facilitate community vigil against Teal Jones logging incursions into this rare and endangered ancient temperate rainforest wilderness. The camp is monitoring the start-up of logging activities in the pristine forest area and is maintaining regular communications with concerned citizens in town. A flood of generous donations and hands-on labour have been provided by supporters from communities across the south island, from Victoria, Gulf Islands, Shirley, Duncan, Port Renfrew, Cowichan Lake, and Nanaimo. This is another encouraging sign of the widespread support for the Central Walbran Ancient Forest, a small 485 hectare area, in the heart of the Walbran valley. All members of the public sharing concern for the fate of the old- growth forests of the Walbran Valley are welcomed to participate in witness camp activities. These include guided group hikes into threatened forest groves, co- operative work parties building camp infrastructure, public access trail repairs, scientific research efforts and big tree measurements. The camp supports people’s rights to witness the destruction of these public lands, with its purpose aimed at protecting the forest from further industrial destruction. The camp is directed by a code of conduct that encourages peaceful and constructive activities, commits to safety and respect for all participants and forestry workers and fosters a drug and alcohol- free environment. To ensure the ecological integrity of the watershed and Carmanah/ Walbran Provincial Park (whose boundaries were drawn up in 1995) this area is urgently requiring protection from acquiescence to timber interests intent on liquidating some of the world’s last giant, millennial western red cedars.